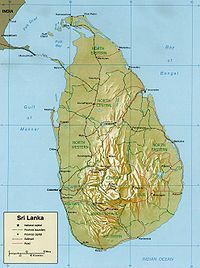 The Democratic Socialist Republic of Sri Lanka (formerly Ceylon) is a pear-shaped island off of the southern coast of India, which obtained its independence from Great Britain in 1948. Sri Lanka has a Buddhist majority, and the Tamils (who are mostly based in India) are the main ethnic minority. For many years until their defeat in 2009 the Tamils led a civil war demanding independence. The Muslims comprise a smaller minority. This page has been accessed 18,841 times.